Having made an acquisition that significantly expanded its healthcare portfolio, Konica Minolta Healthcare hoped to make major inroads in a sector where they had a relatively minor presence. Articulate a story that would cut through, resonate and move them forward. When you say Konica Minolta, most people think cameras. Or copiers. 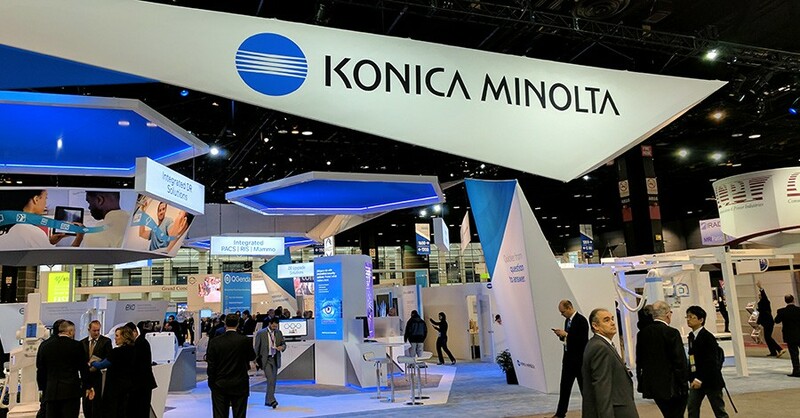 So launching Konica Minolta Healthcare meant communicating the scope and strength of their offering—which includes X-ray, ultrasound and healthcare IT solutions—and differentiating it from competitors with a unifying story. Our discovery process revealed that the sweet spot for Konica Minolta is mid-sized healthcare organizations looking for improved workflow and clinical outcomes. We also learned that a common thread in this space is the need for speed. Faster is better, both clinically and financially. We translated Better Decisions Sooner into a brand that fits under the Konica Minolta umbrella, but with a unique identity for the healthcare sector. A distinctive waveform represents the flow of information between patient, equipment, providers and facilities. To give Konica Minolta the flexibility to use icons in a broad range of applications, we created a library of more than 80 to pull from. The new brand made its debut at RSNA, the biggest show for radiology in the US. We helped build anticipation with pre-show advertising, collateral and email campaigns. Bold graphics for the RSNA booth made a splash at the show—which was the goal.